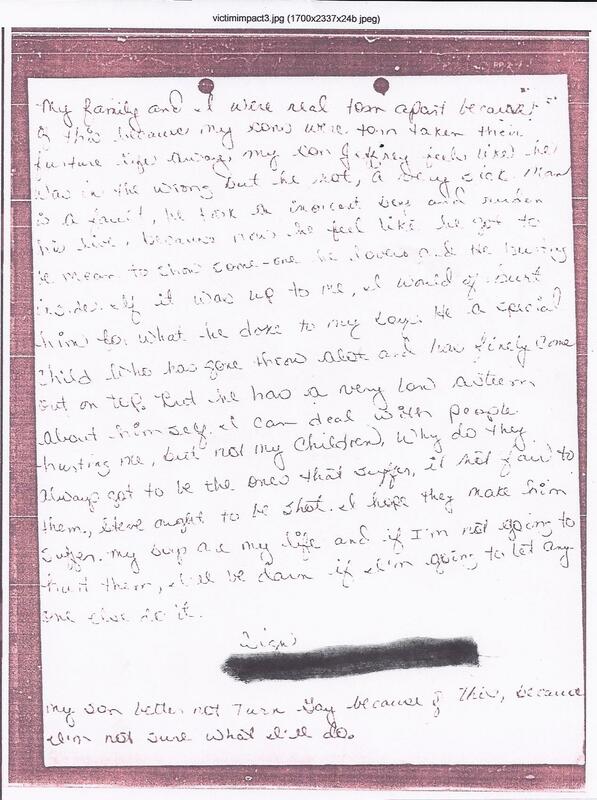 This letter was written about 2 weeks prior to my trial by the accusers mother not the child. I want you to notice where the boys mother admitted in her own handwriting that her son "feels like he is in the wrong." Even after the comment in this letter, there was no investigation about it, it is clear now that they were after a conviction. They should have been after the truth. The trial date stayed the same because they did not care about the fact that I was really innocent. Do you see anything strange in this letter? This letter was given to the judge during my sentencing, and also, if the boy felt like he was in the wrong, why didn't the prosecution investigate instead of having a trial. Further, why did the boys mother not feel relieved that it did not happen? The State did what ever it took to get a conviction, right or wrong. The prosecution had no physical evidence. They knew about his confession and did not even ask him about it on the stand. It was hidden from the jury successfully by the help of the prosecution and my counsel. I obtained this when I had the court house copy all of my files from my case and did not discover it until March 2012. I was really surprised. This statement was not read in open court. It was handed to the judge and this was done to hide it from the defendant. Never knew anything about it. This was submitted by the DA to the trial judge at my sentencing. This letter actually proves my innocence. The boys mother states that "My son Jeffrey feels like he was in the wrong." It is very obvious that she knew about the confession that was hidden from the jury from the prosecution with the help of my counsel. After thinking about this letter more, and the statement, "My son Jeffrey feels like he is in the wrong" was because she knew the confession existed and thought it would come out at my trial. My lawyers hid the audio taped confession from the jury so her statement really looks out of place since the confession did not come out at the trial. She wanted to explain to the judge in this letter why Jeffrey would even think he was wrong in the first place. Further, the mother also writes that, "He took an inocent boy and ruden his live." I want to ask a question. If her son felt like he was in the wrong then how could have I ruined his life?? I did not commit these crimes. If you read this entire letter, you will see it is mainly about Jeffrey. He is the one that confessed to me that he was sorry and his own mother made him lie. Please click on the Confession tab to see how my attorney withheld the confession from the court and claimed it was manufactured evidence which in reality, it was not made up. Jeffrey really apologized to my face, not secreted in another room as my attorney said. The Intimidation charge was filed to cover this evidence up and after I gave my lawyer the taped confession. My lawyer told me that day that "You may be charged with Intimidation of a States Witness. They charged me with this on August 16, 1991. I was arrested on my birthday on August 28. This happened about eight months after I was arrested on the Indecent Liberties charge.. The State charged me with Intimidation , 6 days after the child confessed to me. Further, Michael claims he saw me do it to his brother. He lied because his brother confessed. How could Michael have seen me do it to his brother? His other brother confessed that he was sorry. During court testimony, Jeffrey did not testify to any sexual abuse. He confessed about a year earlier. So of course, he did not know why he was there! Jeffrey did the right thing by apologizing and thought he had cleared it up. Yet they went to a trial even though he apologized. The boys mother put me through a trial and had me convicted of something she knew I did not do. All she wanted to do is make me suffer since she was told I had a prior conviction in Virginia for Child Molestation which was all a lie perpetrated by DSS. This was told to her in order to get her to file charges. I can tell you, these crimes never happened. Please let me prove that it didn't. When I met this family, she had told me that Jeffrey had been molested by his father after we saw his father at a church bingo game. His father even made the comment to me, "You can see why we got divorced, and it is better you than me." Why would she let me take the blame for something I did not do. If these children were abused, I would like to help her find the real person that did it because it sure was not me. Another statement that I find very odd, "He (Jeffrey) feels like he has got to be mean to show someone he loves and he is hurting inside." If Jeffrey feels like he has got to be mean to show someone he loves" Then why does Jeffrey feel like he is in the wrong, UNLESS, his own mother made him lie? The way I look at the statement is that Jeffrey had falsely accused me to prove to his mother that he loves her. I guess that Jeffrey could not take it anymore and finally had to tell the truth. I told him that day that I forgive you. I never went over to their house again when the mother told me not to come back. During the Intimidation, they used the boys mother as the victim when all I saw was Jeffrey in my friends house. They lived behind them. This letter should make it very clear that I am innocent. I have suffered 25 years for something I did not do and the judge in my case sent me to prison after reading the letter. The judge should have thrown the case out right then. This statement comes in three pages and have them all. I just have the handwritten page posted. I have all of my paperwork and everything makes complete sense to me now. Why it happened. I just hope and pray everyday that I will have an opportunity to make the truth known. I will do everything in my power and would say so on national TV to bring it out. If you were really abused, I want to find the person that did it. I do not like people that abuse children. I did not do it, but give me a chance and let me take a lie detector test on national TV so I can prove my innocence and show that I did not do anything to you. My family should not have to pay the price anymore for something I did not do.